A woodworking and building trade concerned with making or manufacturing wood or timber items in a workshop situation that will later be used in a building. The making of doors, windows, stairs, cupboards etc. A building or manufacturing trade concerned with making or manufacturing wood or timber items in a workshop or factory situation that will later be used in a building. The making cabinets, cupboards, wardrobes etc. That will be built into a building. The joint of a door bottom rail and a stile. It can be made by hand but it is so much quicker to make by machinery. 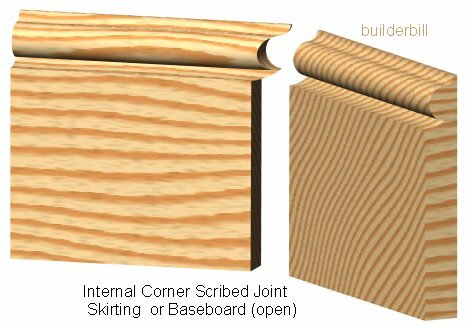 The term joinery comes from the word for joint and it is mostly about using joints to make things out of wood that are useful in building construction. It is about making items like doors and stairs in a workshop situation, where specialised machines are available but it does of course extend to working on site. The trade training is usually carpentry and joinery and so there is not a clear distinction between the two branches of what are in effect the same trade. Some guys may work only in a workshop situation, specialising in machining, or assembly. Some joiners may make and fix just their own product. Stairs or windows for example. Other carpenter/joiners may work on site fixing only the internal fittings, doors and trims. They are said to be second fix carpenters or trim carpenters. 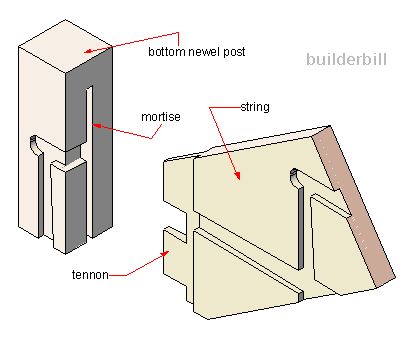 An example of a stair construction joint., housed string to newel post. The joint above is quite complicated and needs machines to make the mortise and tenon joints efficiently. Other methods of stair building are carried out entirely on site and with the use of modern power tools they are also very efficient. Like most things there are pros and cons to each system. The ever evolving small power tools are making possible work on site that not long ago would need a well set up workshop. Corner of a door, door frame and architrave. Note the clearly defined medulary rays in the door top rail and panel. 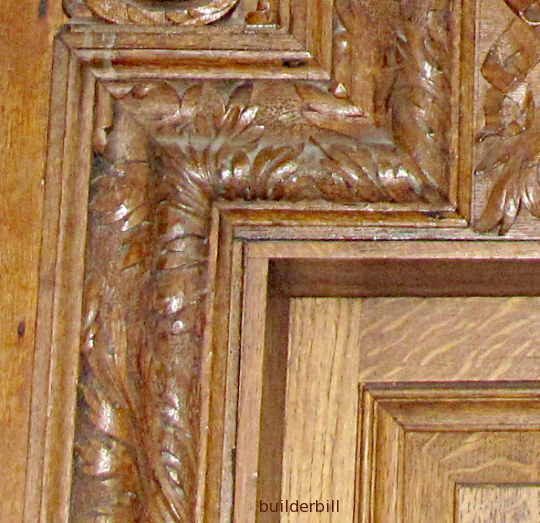 Here is an example of painstaking and detailed work that would have required a lot of workshop machining and then excellent trim carpenters to do the fixing. Trim carpentry, coping a baseboard. The sketch above (for my non US readers) is a scribed joint to a skirting board. Used all the time by 2nd fix chippies. (Or I should say should be used all the time, because when d one well it minimises the look of gaps when shinkage occurs, BUT ordinary internal mitres with a toch of expandable gap filler to the same thing for painted work). Cabinetmaking is a specialist section of joinery. They mostly concentrate on wardrobes, kitchen and bathroom cabinets and other built-in detailed joinery cupboards. They can supply only leaving the builder or homeowner to fix or they supply and fix.